The Caribbean island of Roatán, about 40 miles off the coast of mainland Honduras, is well and truly on the expat radar. But that doesn’t mean there aren’t real estate bargains to be had. Prices here dropped during the housing crash of 2008 but have since leveled off. Plus, due to the devaluing of their dollar, Canadians, a major percentage of buyers on the island, haven’t been buying in recent years. Roatán, which is about 48 miles long and five miles wide, has everything you might want in a Caribbean destination: warm weather year-round, dozens of beautiful beaches, clear turquoise waters, palm trees swaying in the breeze, and a palpable relaxed “island vibe.” You have plenty of beach bars, funky little boutiques, and world-class restaurants (from Thai to sports bar fare to local seafood like whole red snapper). There are several condo developments in Roatán, especially on the more developed and popular west side of the island. (The east is mostly homes and more isolated.) Communities like West End and West Bay are the epicenter of tourism and expat life, where you’ll find the most restaurants, nightlife, and such. So, many choose to live there, especially if they are only part-timers. You can also snorkel right off the beach in West Bay—the reef is close to shore in this spot. In the heart of West Bay, Roatán’s “high-end” area, is a one-bedroom condo for $169,000. There is a tropically landscaped community pool, a beach bar, and restaurant. And you’re just steps away from the sand. A two-bedroom condo in the same development is listed at $259,500. And it comes fully-furnished. Just down West Bay beach is a luxury condo development with a large studio unit for $199,999. It has granite countertops and 24-hour security and you’ll also have access to an infinity pool, swim-up bar, and a restaurant. In West End, a two-bedroom condo, within walking distance of restaurants and shops is available for $239,000. You have a sea and sunset view from your private balcony. Nearby another two-bedroom unit, a short walk to the beach, is for sale for $122,000. If you’re thinking of setting up an income-generating rental, there’s a pair of studio condos available for $137,000 in West End. You could live in one and rent the other out. Just as there are plenty of real estate options on Roatán, you’ll also find plenty to keep you occupied. And of course, most of the activities on offer revolve around the beach and the sea. Unsurprisingly, the beach is popular in Roatán. 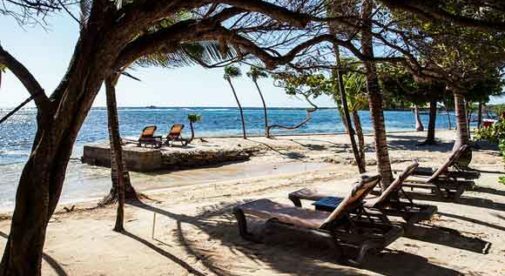 There are deserted stretches where you can hang a hammock and not see another soul all day, as well as spots fronted by beach bars with reggae on the sound system and waiters bringing drinks to your lounger shaded by a small palapa. Roatán is perhaps best-known for some of the best scuba diving in the world thanks to the MesoAmerican Reef, the world’s second largest. This is what put it on the map originally, with other sun and beach-loving visitors following later. Thanks to the reef that surrounds the island, as well as other spots farther offshore, you have dozens of places to dive and see manta rays, sea turtles, pufferfish, and more. You can even dive for lobster. The island is also getting more convenient to live on all the time. A recently opened hospital, one of the best in the country, features a 24-hour emergency room, surgical suites, and specialist doctors. A new power plant coming online this year will make the electricity more reliable. There’s also high-speed internet and good cellphone coverage. And local grocery stores have slowly but steadily increased offerings over the years so that now you can get all sorts of gourmet and imported products. On Roatán, you have that laidback Caribbean lifestyle, fun activities, beautiful surroundings, and all the comforts and services you need close at hand…it’s the perfect island-living package.